Guns, Shooting Sports, Stock Refinishing, etc. If it involves firearms then find it here. This is the third post on my Richard’s Semi-Inlet Walnut Rifle stock for my Savage Model 111 in 30-06. This also makes the rifle itself complete. It’s almost done, and is as done as it is going to be for some time. Determine where you want the studs to be. Another rifle or the original stock will give you a good idea where they should be. Trust your eyes. Tape off the stock with Blue painters tape. This will give you a place to mark so that you wont mess up the finish on your stock. It will also negate tear out when you drill. Using calipers find the center point on your stock. My stock was approximately 1.5 inches thick. Have of that would be .75 inches. I have found that if I mark .7 inches then measure from the other side .7 inches I’ll get two marks very close together. With two marks so close it’s easy to eyeball the exact center. I do the will many projects with much success. Use an automatic center punch to mark your drilling locations. I got mine from Harbor Freight and they are wonderful little tools for getting accurate holes and guiding a drill bit. Drill the holes with a proper sized drill bit. You want the studs to go in tight but not so tight that it splits your stock. Nor do you want it to go in loose and comes loose constantly. Err on the side of to small an if there is too much resistance go up a size in drill bits. The proper depth is 1/8 of an inch deeper than the stud screw is long. I use tape to make a flag so I know when to stop. Install the studs with Wax. Coating your screws with wax does two things; first it lubricates the screw so it goes in easier, and second, it helps seal the exposed wood in the hole and stopping moisture from getting in. My set came with little washers that allow you to stop the stud in the right place. I got mine started by hand then used an open end wrench to turn them in the rest of the way. There where little flats designed for a wrench, I don’t remember what size. Install your cheap, ugly, sling and start shopping for a nice leather sling worthy of your custom stock. This is the sling I’m leaning toward right now. Here’s the video of how I fit the recoil pad to my rifle. I chose a Kick-EEZ 3/4 pad. I’ve had this brand on my competition shotguns and they shape well on the sander. The tool of choice for this project is a benchtop disk/belt sander. If you have a belt sander that you can lock on and mount in a vice that could work. I adjusted my Length of Pull by cutting the stock on the miter saw. I then mounted the pan and used a razor blade to scribe a line. Then I sanded to the line. Pretty simple. I also installed sling studs but that will come in another post. Finally. This project kept getting pushed back and pushed back again. I’m happy to say that I’ve reached a milestone in my Custom Savage 111 30-06 build. This project started with a basic Savage bolt action rifle with a horrible plastic stock, poor trigger, and a cheap Bushnell scope. I replaced trigger with a Rifle Basix SAV-1 Replacement Trigger, and the scope with a Nikon Buckmaster 3-9 that I pulled from another rifle. I’ll be upgrading the scope to a premium quality optic in the future but the Nikon is a great scope for the money. The stock I painted with Rustoleum Camo Spray Paint to make it bearable until I could find a replacement. This Richard’s Micro-fit Rifle Stock has been sitting under my bed for about a year. I finally started working on it. I’ve finished inletting the action to receive bedding compound, shaping the forearm tip, and sanding to 100 grit. I still have a lot of work to do. I made two of these boxes. One for a friend’s birthday, the other is to sell on Etsy. The box measures 20″Lx13.5Wx6″D. It’s the perfect size for your ammo, cleaning supplies, shooting gear, or tools (if you prefer). My goal for this project was to combine beauty with function. You read a lot of opinions on rifles on the internet from people who probably have never shot the guns they are bashing. This was my birthday present back in October. 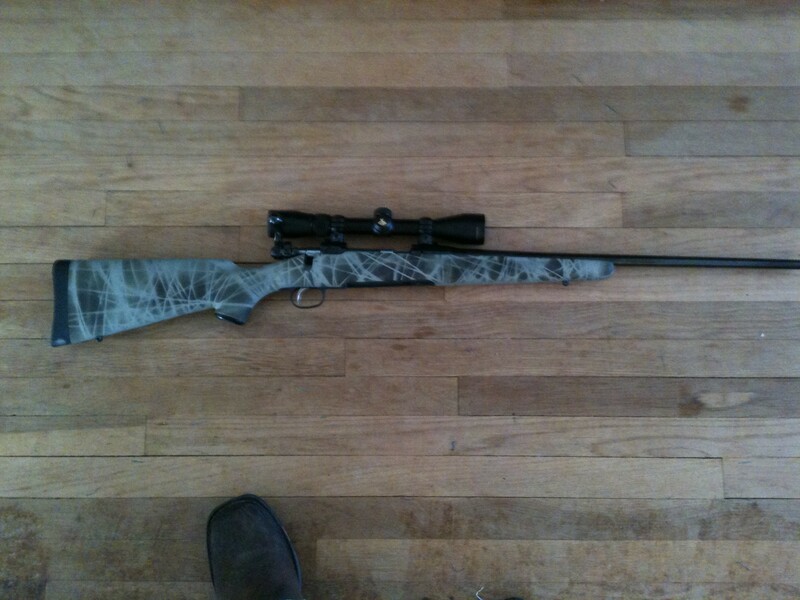 A Savage 111 30-06 with a Bushnell 3-9x scope and detachable box magazine (DBM). I Got it for $300!! So why did I get this inexpensive rifle? This is a Beretta 391AL with a stock I refinished. I got a great deal on in because it was shipped from the factory with a clouded finish. Sadly, I sold this gun after I refinished the stock.